Shaw winner of four awards from the CalRecycle waste reduction awards program recognizing waste-to-landfill reduction programs. 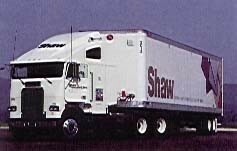 Shaw recovers used carpet and breaks down the fibersto be recycled into new product. This helped divert 8.5 million pounds of waste from landfills, according to Shaw. Shaw uses the recycled material to produce its Green Edge carpet line. Customers are willing to pay a premium for the carpet, and recycling material can help save money compared to making entirely new carpet. The four Calf. carpet plants saved $1.3 million in landfill, waste reduction and reuse costs.